Before beginning a writing blog post, think come in mind, how to write, where to start so that it become high quality. When you sit in front of a computer, either you have had a title or you will grab the title from editorial. Before start writing a blog post, you have to keep a thing in mind clear, you aren’t writing a blog post to complete your job, not about how many frequently you make focus on your keyword. When you start to writing blog, you ought to spotlight on the reader, whenever they come on your blog, they ought to get something new from your blog and they enjoy reading. 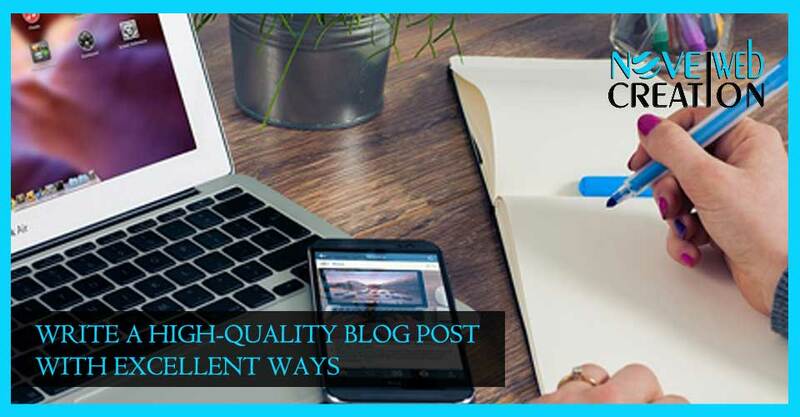 High-quality blogs are a sort of personalization, you have to write sometimes that embolden to them, suggest them amazing ideas and thoughts related to your blog’s post. If you get confused to get it done, then you can constantly go through this post here is excellent ways to write a high-quality blog post. No one can claim that they can write hundreds of page without making a docket. Before we write a post, we need to recognize, where we have to start, who reader understand and get information along with enjoying the reading. So pick up your specific topics and go through that. Title is the first connection of you and your reader, you title will poor and a boring then reader will not take interest to go through your blog. So endeavor to take eye catcher title. You are writing content to provide information on your post, so you need to write truth blog and deliver to the reader. So before writing a blog, you have to recognize truth. High-quality content is sort of personalize, you might writing your blog to create your brand, but you have to conscious that, if you are providing information, it should be true, It not that your writing content only for reach out your target word.